Due to expected high demand, you must purchase Ryan Hurst autograph, autograph + picture and professional photo op tickets in advance. Click on the "I" icon next to any item and it will explain what is included. All sales are final. No refunds. We are sorry to announce that due to scheduling issues, Ryan Hurst will only be appearing at Pittsburgh’s Horror Realm & Pop Expo on Saturday, July 25. Ryan will not be appearing on Friday or Sunday. We apologize for any inconvenience. 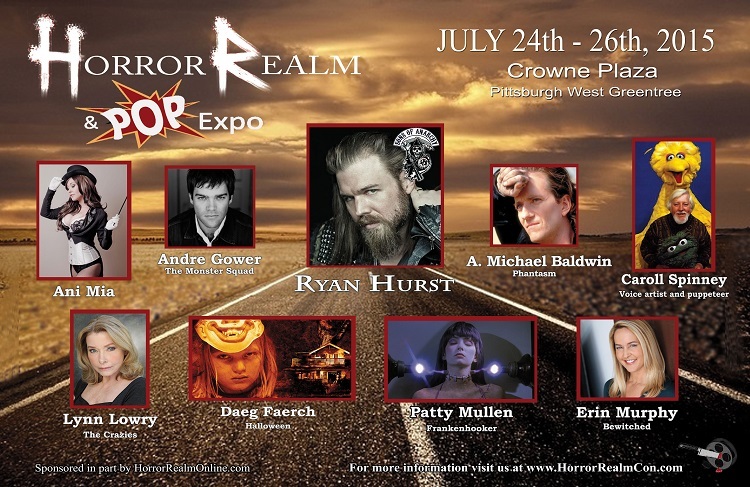 Horror Realm, in association with In Person Productions, is pleased to launch Pittsburgh’s Horror Realm and Pop! Expo on July 24-26, 2015 at the Crowne Plaza Pittsburgh West Green Tree. The three day convention/expo brings the familiar, comfortable and affordable vibe that Horror Realm has built over the last seven years while expanding to offer guests from the pop culture arena. Visit www.horrorrealmcon.com for details including complete guest list and hotel information. Children under 12 admitted for free and must be accompanied by an adult at all times. Free admission for active duty military personnel with current & valid ID. All autographs and photo ops must be purchased in advance for a specified time period. Prices do not include convention admission. All sales are final – no refunds. Professional photo ops are available for purchase. We are pleased to be working with Morbid Memories by Sigler Photography to produce photo ops. Cost varies by guest and includes an 8x10 photo and protective plastic sleeve. Photos will be ready within two (2) hours and can be picked up on site.